Susan’s particular interest in writing for children stems from two years of volunteering with Dorset Reading Partners – a charity that inspires primary school children to enjoy reading, improving their literacy skills and encouraging confidence in their abilities along the way, an experience that really underlined the power of a good story. 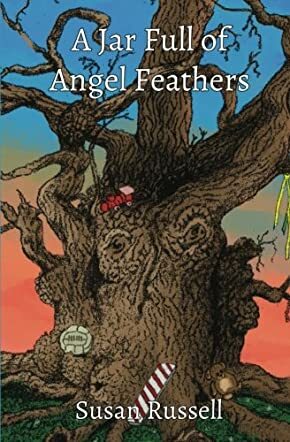 Her first novel, A Jar Full of Angel Feathers, reflects two of the major factors that tend to influence her writing – a deep love for the magic and mystery of nature, and a fascination for the ways in which people are shaped by the experiences that come into their lives. There is no one to organize their day; no one to keep them in order after Alex loses his mum. His father wants to start afresh by making big changes in their lives in A Jar Full Of Angel Feathers by Susan Russell. Alex’s dad decides to send him off to Cornwall, to Mallow Cottage with Aunt Mary, but Alex is unhappy with the decision of moving to the countryside. Alex loses his grey Dinky car and he thinks Aunt Mary has thrown it away. It is a beautiful story about friendship, family, acceptance, change, grief, healing, and magic. Will Alex finally make friends at the new place? Will Alex adjust to life in the countryside? The story is relatable and all the characters are nicely sketched. Whether it is Aunt Mary, the Gnarly Man who is the guardian of the woods and fields, or the young girl, Flora, Alex begins to see life with a different perspective. The messages in the story are woven into the plot with expertise and the author paints a beautiful picture of the English countryside. The story will instill a love for nature as young readers get to explore the woods, learn about seasons, and many other interesting things along with Flora and Alex. The narration is simple yet detailed, making the scenes vivid for readers. There is an element of magic and whimsy that will captivate readers and will make this a great book for story-telling sessions in classrooms and school libraries. Parents and grandparents can use it as a bedtime storybook and will find it useful when it comes to helping children understand about life, loss, sorrow, and how to accept this and come to terms with things.